DURABLE: Made of a friendly felt material, a highly durable, UV resistant, non-woven fabric that provides exceptional air flow throughout the soil and root systems and allows excess moisture to easily drain away. ROOT BENEFICIAL SYSTEM: Provides ideal drainage and aeration. Encourages "root pruning" for a healthier root system. GOOD FOR PLANTS: Warms quickly in the spring, releases excess heat in the summer and provides excellent drainage for healthy plants. 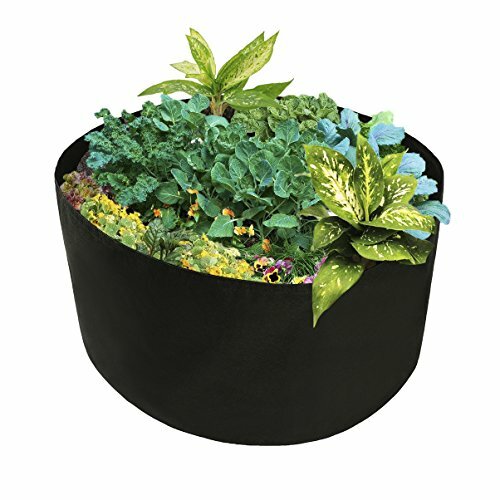 EASY TO PLANT: Easy to assemble, no tools required, just add soil, add plants, seedlings or seeds and water,make planting more easy. WIDE USE: Instant fabric soft raised garden bed for plants, flowers and fresh herbs, vegetables and fruit. Ready to go out of the box; No assembly required.